He was welcomed by former Gujarat Chief Minister and chairman of Somnath Temple Trust Keshubhai Patel. RSS chief Mohan Bhagwat arrived in Somnath town in Gir Somnath district of Gujarat on Thursday as part of his six-day visit, during which he will attend a meeting of the organisation’s office-bearers. The annual meeting of RSS’s Akhil Bharatiya Prant Pracharak will be held in Somnath town between July 15 and 17, a spokesperson of the organisation said. After his arrival in Somnath, located around 400 kms from here, Bhagwat visited the famous Somnath temple, which is one of the 12 jyotirlingas in the country. He was welcomed by former Gujarat Chief Minister and chairman of Somnath Temple Trust Keshubhai Patel. 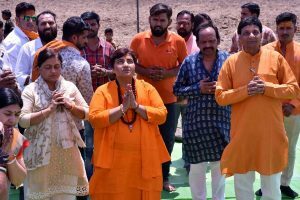 Bhagwat offered prayers at the temple and later paid tributes to the country’s first home minister Sardar Vallabhbhai Patel at his statue located on the temple premises. Bhagwat is scheduled to preside over Samajik Sadbhav (social harmony) meeting in the town this evening, where people belonging to different communities will hold talks, Gujarat RSS spokesperson Vijay Thaker said. 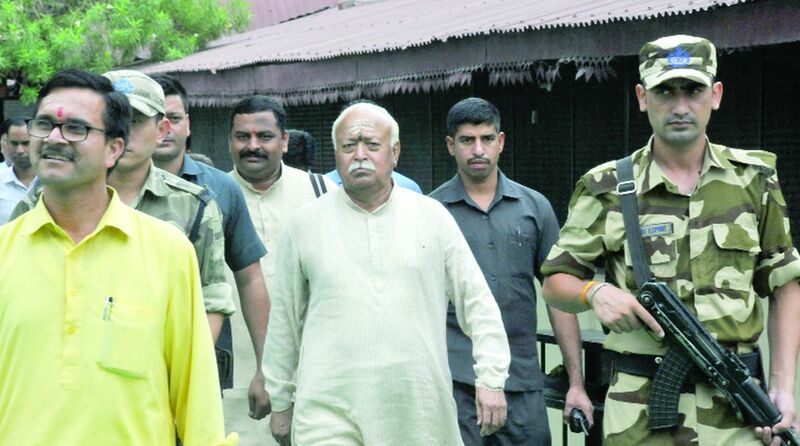 RSS general secretary Bhaiyyaji Joshi is expected to reach Somnath later in the day, he added. For its administrative purposes, the RSS has divided the country into 12 kshetras (regions), which, in turn are sub-divided into 39 prants or states. “During the meeting, discussions will be held on how to strengthen the organisation, the works done by the RSS in different parts of the country and the future course of action,” he said. Around 200 delegates are expected to attend the meeting, Thaker said.